Powder metallurgy is used to process powered feedstock for manufacturing various types of components in numerous industries. Powder metallurgy is used for manufacturing filters which require greater strength and shock resistance. Additionally, it has applications in the manufacture of cutting tools and machinery such as gears, bearings, bushes, and magnets. It is used across business machines, household applications, hardware, hydraulics, and hand tools. Growing advancements in the technology in electronic and computer components are likely to propel demand for non-ferrous metal powders including titanium-based powder and aluminum growth of the market for powder metallurgy over the forecast period. Additionally, growing demand for the spherical metallic shapes for manufacturing metal injection moulding (MIM) or 3D-printing is boosting uptake of powder metallurgy and likely to propel the growth of the global powder metallurgy market. Lower need for energy in the energy consumption which is leading to boost uptake of raw material and likely to fuel growth of the global powder metallurgy market. However, high capital requirement coupled with complexity in manufacturing 3D shapes is restraining growth of the global powder metallurgy market. According to report, the powder metallurgy market pegged the value of US$6,514.05 mn in 2017 and expected to expand with a CAGR of 6.8% over the forecast period from 2018 to 2026. The powder metallurgy market is segmented on the based on the technical material, end user, and region. Based on material, the global powder metallurgy market is segmented into steel powder, iron powder, and non-ferrous powder. The non-ferrous powder is further sub-segmented into aluminum, tungsten, nickel, copper, cobalt, and others. Of these, iron powder segment dominated the global market for powder metallurgy. This growth is attributable to the wide use of powder metallurgy in for its characteristics such as high heat resistance, high stability, and high density across the automotive, manufacturing of machinery, and chemical industry. Based on the end user, the global powder metallurgy market is segregated into automotive, electrical and electronics, industrial, and aerospace. Of these, the automotive segment is witnessing higher demand for manufacturing vehicles with low weight and increasing need for improving automotive output. However, the aerospace segment is expected to witness high demand for the powder metallurgy over the forecast period. On the basis of region, the global powder metallurgy market is segmented into Europe, North America, Latin America, Asia Pacific, and the Middle East and Africa. Of these, North America dominated the global powder metallurgy market 2017 and expected to remain dominant over the forecast period owing to higher demand for the manufacturing additives in the region. Europe is expected to account for the second leading share in the revenue of the global powder metallurgy market. However, Asia Pacific is expected to expand with the faster CAGR over the forecast period owing to expansion of automotive sector in the developing countries present in the region. Additionally, emerging automotive industry across developing countries in the Middle East and Africa is also expected to witness lucrative opportunities over the forecast period. Some of the players operating in the global powder metallurgy market are GKN Hoeganaes, H.C. Starck, Sumitomo Electric Company Ltd, Sandvik AB, and Hitachi Chemical Company Ltd. The top three players such as Sumitomo Electric Company Ltd, GKN Hoeganaes, and Fine Sinter Company Ltd. are collectively accounted for the share of 35% in 2017 and GKN Hoeganaes accounted for 17.1% share in the revenue of the global powder metallurgy market in the same year. These key players are increasingly taking part in the activities such as mergers and acquisitions for instance, in 2016, Sumitomo Electric Industries, Ltd. one of the leading company acquired the US-based manufacturer of assembly parts, Keystone Powdered Metal Co. in order to ensure their strength. Powder metallurgy is the process of forming precision structural metal components from metal powders. The powder metallurgy process is a cost-effective process for manufacturing simple or complex shapes and provides significant advantages over conventional processes. These advantages include favorable surface finish, controlled porosity, low scrap generation, high production rate, excellent wear resistance and friction co-efficient, and superior chemical homogeneity. Increase in usage of powder metal in various applications such as magnetic assemblies, filtration systems, structural parts, sharp gemstone-grinding blades, and auto metal components is boosting the powder metallurgy market. Based on material, the powder metallurgy market has been classified into iron powder, steel powder, and non-ferrous powder. The non-ferrous segment has been further split into aluminum, copper, nickel, cobalt, tungsten, and others. Iron powder is a leading segment of the global powder metallurgy market. In terms of end-user, the global powder metallurgy market has been categorized into automotive, electrical & electronics, industrial, aerospace, and others. Expansion in the automotive industry across globe is driving the powder metallurgy market. 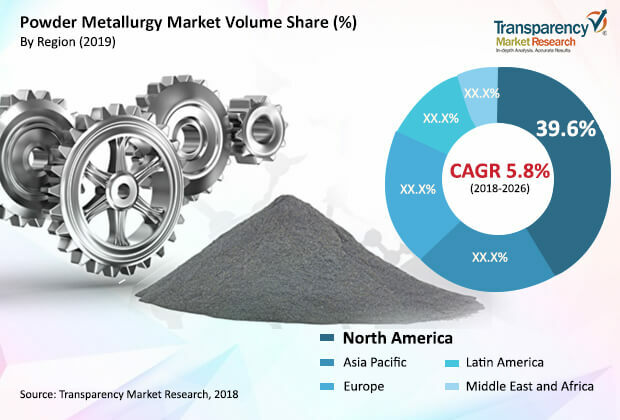 In addition, rise in industrial activities and increase in demand for cost-effective solutions for structural components in various applications such as agricultural machinery, OA equipment, motorcycles, and home appliances are propelling the powder metallurgy market. Low energy requirements and high raw material utilization rate of the powder metallurgy process are some of the other factors boosting the market. Based on region, the global powder metallurgy market has been segmented into North America, Europe, Asia Pacific, Latin America, and Middle East & Africa. North America dominates the global powder metallurgy market, followed by Asia Pacific. Rise in consumer interest in electrical vehicles and emphasis on fuel efficiency of vehicles are pushing manufacturers toward designing lightweight components, thereby impacting the powder metallurgy market positively in both the regions. The market in Europe is likely to expand at a moderate pace during the forecast period. Germany is a hub for premium car production and is likely to continue to set a benchmark for the automotive industry due to the presence of world class R&D, labor force, infrastructure, and automotive manufacturing heritage. Demand for powder metals is projected to increase significantly in the country due to a rise in international demand for lightweight, high-value, small, and compact cars and premium SUVs. These factors are expected to propel the powder metallurgy market in the region. The market in Latin America and Middle East & Africa is anticipated to expand at a sluggish pace compared to mature economies due to the heavy reliance of these regions on imports. However, expansion in the automotive industry in countries such as Mexico, South Africa, and Brazil is expected to offer lucrative opportunities to manufacturers operating in the market. The report analyzes and forecasts the powder metallurgy market at the global and regional levels. The market has been projected in terms of volume (kilo tons) and revenue (US$ Mn) from 2017 to 2026. The study includes drivers and restraints for the global powder metallurgy market. It also covers the impact of these drivers and restraints on the demand for powder metallurgy during the forecast period. The report also highlights expansion opportunities for the powder metallurgy market at the global and regional levels. The report comprises a detailed value chain analysis, which provides a comprehensive view of the global powder metallurgy market. Porter’s five forces model for the powder metallurgy market has also been included to help understand the competition landscape. The study encompasses market attractiveness analysis, wherein the end-user and material segments have been benchmarked based on their market size, growth rate, and general attractiveness. The study provides a decisive view of the global powder metallurgy market by segmenting it in terms of material, end-user, and region. These segments have been analyzed based on present and future trends. Regional segmentation includes current and future demand for powder metallurgy in North America, Europe, Asia Pacific, Latin America, and Middle East & Africa. The report also covers individual material and end-user segments of the market in all regions. The study includes profiles of major companies operating in the global powder metallurgy market. Key players profiled in the report include GKN Hoeganaes, Sumitomo Electric Company Ltd, H.C. Starck, Hitachi Chemical Company Ltd, Sandvik AB, Fine Sinter Company Ltd, Miba AG, Carpenter Technology Corporation, Allegheny Technologies Incorporated, SMC Powder Metallurgy, Metaldyne Performance Group, and SHW Group. Market players have been profiled in terms of company overview, business strategies, recent developments, and SWOT analysis. The report provides the estimated market size of the global powder metallurgy market for 2017 and forecast for the next nine years. The size of the global powder metallurgy market has been provided in terms of revenue. Market numbers have been estimated based on material, end-user, and region. Market size and forecast for each material and end-user segments have been provided for the global and regional markets.